Handsome, stately, dramatic and comfortable; The Antonio Wicker Sofa is sleek and classy. This piece showcases arms that are flat on the outside of the structure, but have a slight angle on the inside of the arm for a contemporary look that sets it apart. 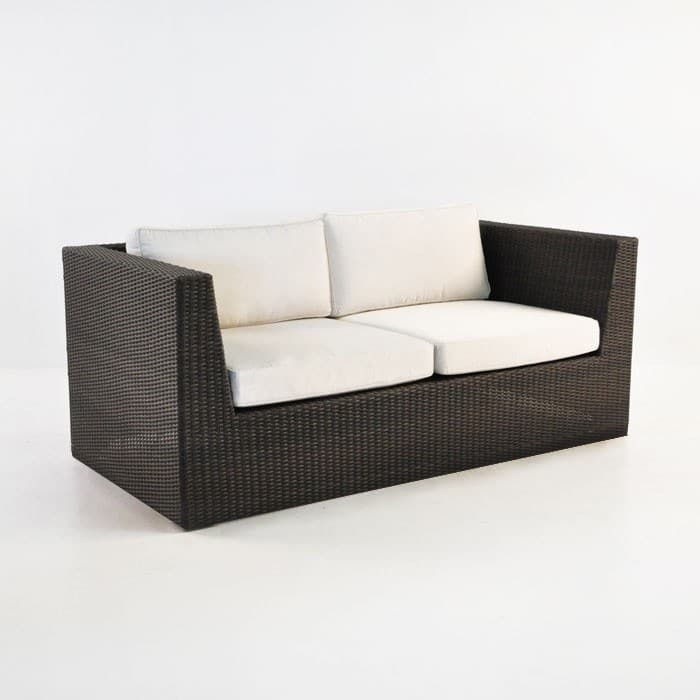 This charming, attractive Antonio Wicker Sofa is perfect on its own or as part of a larger unit. A fantastic low-lying piece of furniture, the Antonio Wicker Sofa is 245 centimeters long and 90 deep, pulled into a boxy, linear design. 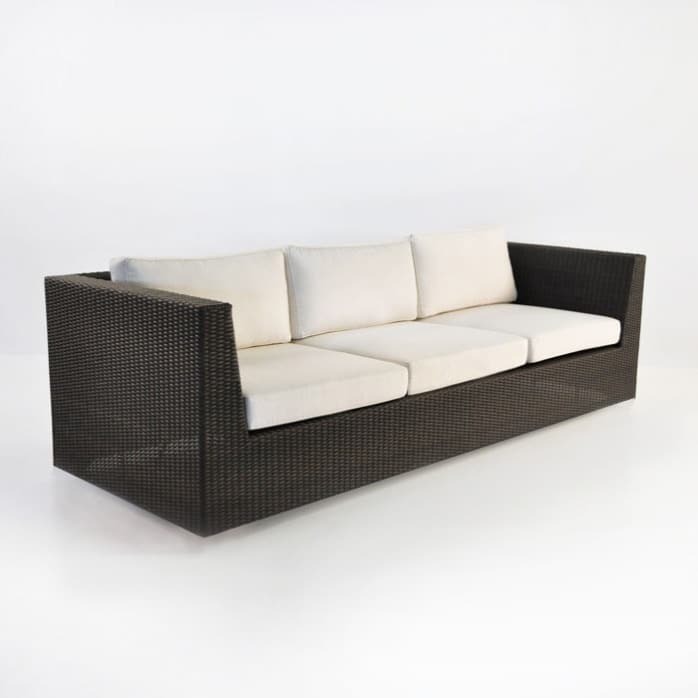 Constructed out of one our favourite brands; the Antonio Wicker Sofa showcases amazing Viro® wicker to its full potential. Being an award-winning product that is sold worldwide, we know that this amazing material lasts. It boasts such qualities as: being through-dyed for fade resistance, UV treated to avoid morphing and misshaping in the sun and it looks and feels stunning! You already know Sunbrella® – recognised everywhere for being an excellent, durable outdoor fabric. But did you know that we fill our cushions with QuickDry® foam? This incredible filler means that after a light rainfall or morning dew, your cushions will dry out! Your cushions wont develop mould or mildew because of this miraculous invention – So you don’t need to bring them in overnight or during the occasional pour down! It is only during periods where there is day after day of rain that it is wise to either cover or bring in your cushions. 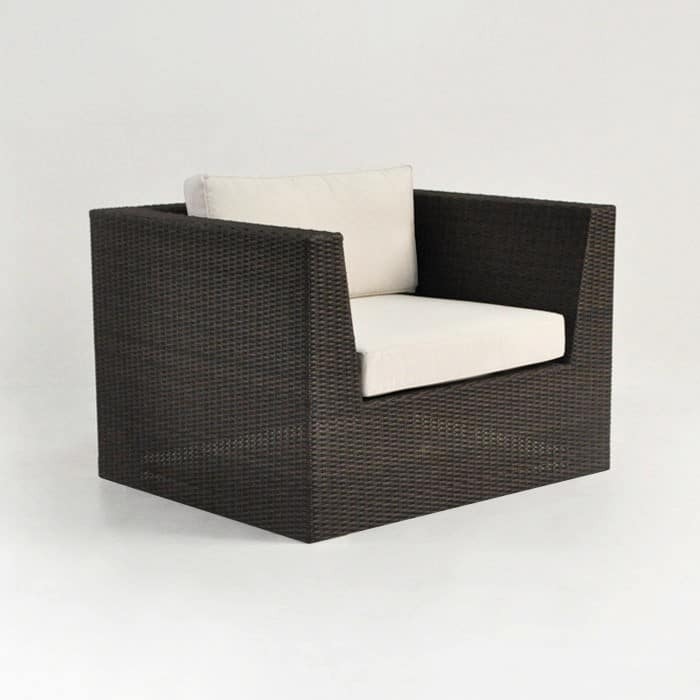 Design Warehouse specialises in all furniture for outdoors! 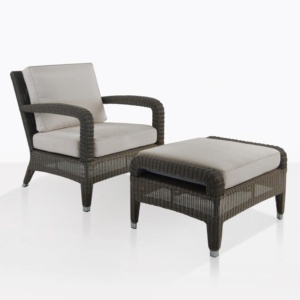 Sun loungers for the poolside, dining sets for a gorgeous patio, bar furniture for your veranda with a view, and relaxing chairs and deep seating for your garden – we have everything in our warehouse in Auckland. Can’t make it in? Call us or enquire online – the sales staff at Design Warehouse are in store everyday from 10am, and we are extremely knowledgeable in our products and configuring them into different spaces. 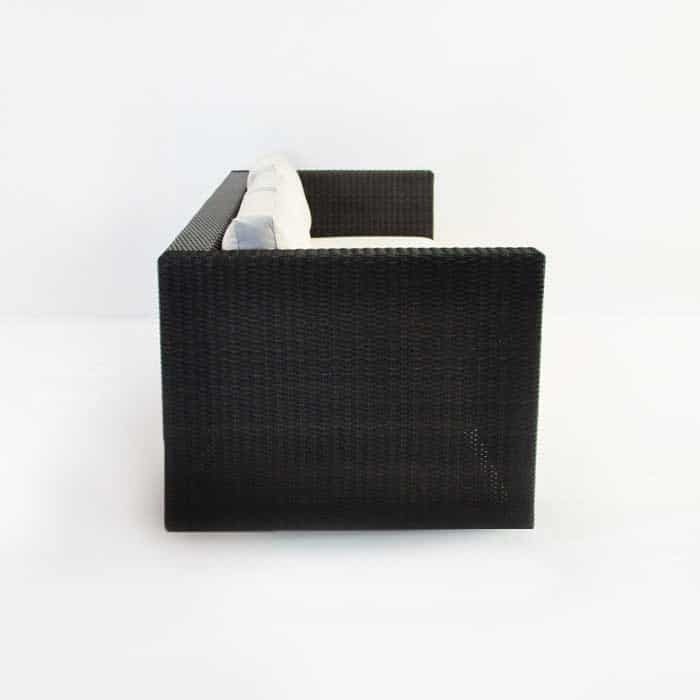 Our Antonio Wicker Sofa seats 3 people comfortably and is absolutely ideal for that afternoon nap that is just for you. The feet of the sofa are hidden, so it appears to float on the ground keeping the integrity of the smooth lines. The java colour is a deep brown that will go beautifully set against your outdoor green garden oasis. Set up your living space with the Antonio Wicker Sofa, loveseat and a coffee table so that your guests can gather around and enjoy cocktail hour. Your large brick patio with the elegant trellis and creeping vine is gorgeous, whimsical and romantic. You want furniture that allows you to enjoy that sense of comfort, but also carries a contemporary flair – The Antonio Wicker Sofa is the perfect piece to begin this transformation! 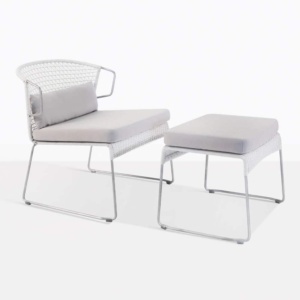 Pair it up with a couple of Stainless Steel and Batyline® mesh relaxing chairs in Black and a Black Raw Concrete Table for a divine blend of materials within similarly linear, chic, exquisite designs. 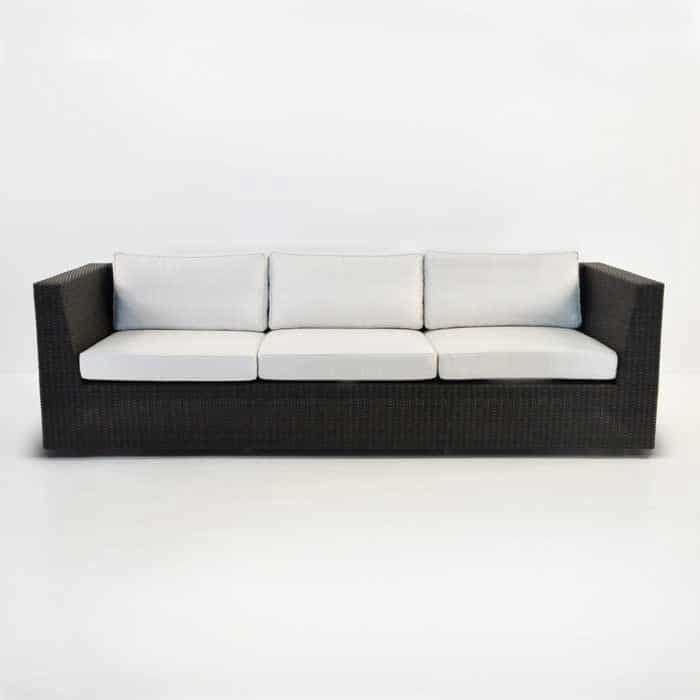 The Antonio Wicker Sofa is made of Viro® outdoor wicker and includes free Sunbrella® cushions.